Over ten years ago I used to get my shopping fix exclusively from retail stores. I’m not proud of the fact that you could find me in some of the worst fast fashion stores that exist, H&M, Forever 21, Zara, Gap, TJ Maxx, outlet stores, you name it. I had no idea where my fashion came from or how it was made, I just wanted more booty. Shopping for that perfect outfit was an obsession. Sometimes I would fall sleep putting together outfits in my head and figuring out what store I could hit up next to create my desired ensemble. Shopping was my recreation and my high. Adrenalin would rush through my veins when the credit card was swiped and I became the owner of the piece I coveted. Arriving home with large shopping bags filled with my hauls was exhilarating. I felt a sense of accomplishment. I couldn’t wait to show them off to both my husband and my blog readers. Aside from the shoes and the handbag which are vintage the rest of the outfit is poor quality fast fashion. The blazer is Forever 21 and the skirt and top are H&M. That comment stayed with me though. It planted a seed of discontent in my brain that grew. I’m forever grateful to Bella from Citizen Rosebud now. I started shopping vintage ages ago partly due to the fact that someone spotted me at one of my jewellery shows wearing the same dress as them…from H&M. It was funny and I made a joke of it at the time but as a person that has always tried to stand apart from the crowd, especially for shows, I was disappointed with my choice and vowed right then and there to forget about H&M. One of my favourite vintage skirts. One of my most worn 1950s vintage dresses from my personal collection. 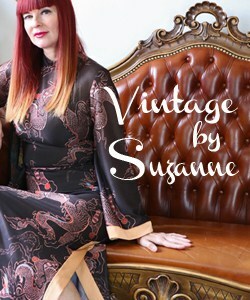 After watching Mad Men my love of vintage clothing grew. 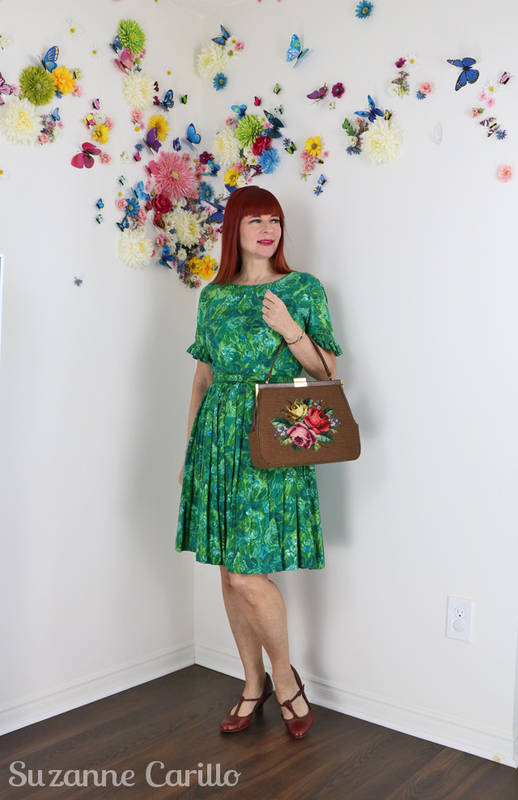 I started seeking out vintage stores and going to vintage clothing shows. 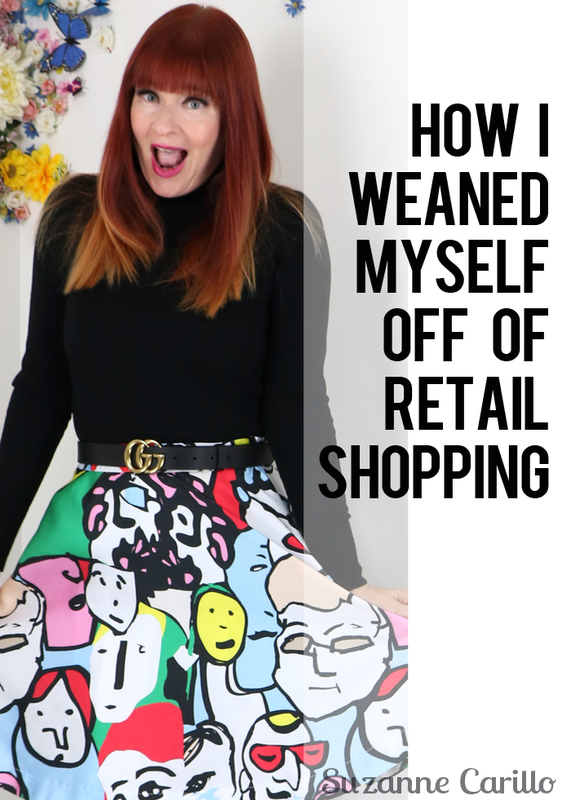 The clothing spoke to me not only because it was different from everything else being offered in the regular retail stores but also because it had a history which made each piece more meaningful than anything I could buy off the rack. 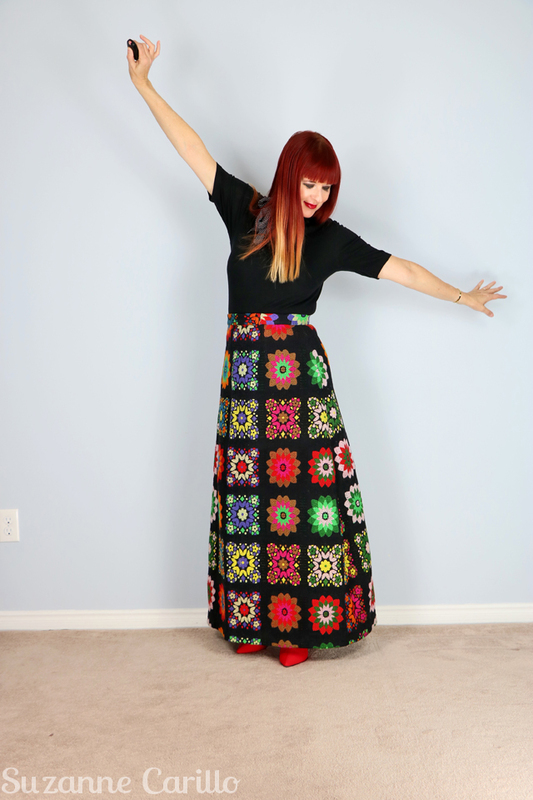 This dress is one of the many pieces I have purchased in a consignment store. This floral silk wrap skirt was another consignment store purchase. Hat and bag are vintage. 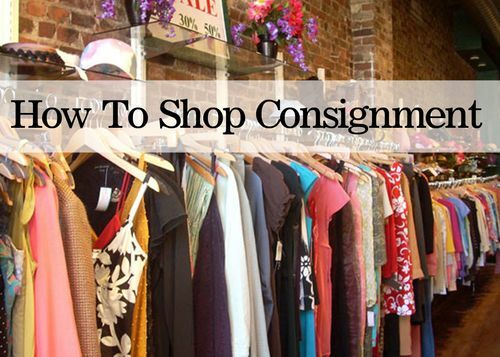 Consignment stores are a very easy transition into secondhand shopping. They are often merchandised nicely and have well curated collections. They are in fact very much like shopping at a TJ Maxx. The prices are about half or less what you would normally pay retail. I even started taking some of the pieces I no longer wanted to the consignment stores for resale. My family has shopped at garage sales and secondhand stores for a very long time. I always had a negative view about this and I called it, “Picking through someone else’s garbage.” Difficult to believe I actually said that, but I did. Oh how times have changed for the better! Vintage sellers I bought from often told me they purchased their beautiful inventory at estate sales. I wanted to check it out for myself. It was a bit of a shock as you can read here but I eventually grew to love the excitement and the thrill despite the bullies and unruly crowds as I wrote about here. I picked this sofa up at an estate sale. The one where we almost got beat up by a gang of estate sale bullies. I discovered that through thrifting I could feed my love of fashion without breaking the bank while recycling for the planet. I researched online for the best thrift stores near my home, the ones that keep a clean, uncluttered store so it would make the transition into secondhand shopping easier and less overwhelming. Previous trips to secondhand stores had left bad impressions, too much like I was going through trash. I made a point to choose better stores which didn’t smell, were well lit with lots of space and well organized. These stores didn’t feel much different from shopping at a TJ Maxx as I mentioned before. The main difference was the price, which was about 90% or less what one would pay retail. I realized that with some patience and tenacity I could find many unique pieces secondhand that were better than what I would find shopping retail. Vintage pieces and the higher priced brands which I normally couldn’t afford were now within my budget. I knew these items would last longer and be better for the planet than any of that cheap stuff I’d been buying retail. I was hooked. Luxury designer dress thrifted and then sold via my Etsy store. After researching more about fast fashion and how it is ruining the planet I decided I no longer wanted to support an industry based on exploitation of people and the earth. I no longer spend money in those stores. Educating myself about how fast fashion is destroying the planet kicked 70% of my shopping habit but I still had that elusive 30% to tackle, my weak spot, Anthropologie. A jumpsuit I still love from Anthro. Anthropologie used to be a very smart retailer. They hooked me in with their artistic displays, unique selection that looked like handmade works of art and their oversized furniture where my husband could wait for me in luxury. The stores even smelled great! They were a mix between visiting an art gallery and visiting a store. I loved them. Somewhere along the line things changed at Anthro. They downsized their creative department which effectively disposed of their artistic displays. The clothing started to look cheap and similar to what you would buy in fast fashion stores even though Anthro’s prices remained very high. When they got rid of the sofa for my husband to relax on while I shopped that was the last straw. I was finally able to break up with my long time love Anthropologie. It’s you Anthro, not me. This jacket is one of the many Anthro pieces I’ve found while thrifting. Since I gave up shopping retail aside from the occasional footwear, underwear and socks I honestly haven’t looked back. Oh sure sometimes I’ll spend some time zoned out scrolling through Anthro’s website and then I quickly remind myself it is everything I despise made to look appealing. They are not socially or ethically responsible for how they produce their clothing and they don’t make an effort to recycle. I once read that unsold items at Anthropologie were destroyed and burned rather than sending them to overstock shops or thrift stores. That made me ill. Imagine the resources used to create those products only to have them eradicated for corporate greed. This is a practice that is still used by many high end brands. My previous obsession with retail shopping has transformed into an environmentally friendly independent small business. Now I spend my shopping time scouring the local thrift stores to stock my Etsy shop. It is inevitable that sometimes pieces of that bounty make it into my own closet from time to time however my main goal is providing excellent inventory for my shop. While I still feel the need to improve upon reducing my consumption in every aspect of my life I’m happy knowing that through my Etsy store I am providing an opportunity for people that might not shop thrift to see pieces in a new light so that they too can begin to fall in love with thrifting the way I have. We are all responsible for our choices. Supporting stores that exploit the planet and their workers means that you are actively participating with full knowledge of their actions. Do you want to be part of the problem or part of the solution? Here are some pieces I’ve thrifted recently which are for sale at Vintage by Suzanne on Etsy. Are you still shopping retail? If so, why? You explain the evolution so well. And the photos speak strongly for your argument–every outfit is chic AND unique. My favorite is the long wrap skirt with the hat and leather blazer. Very ’70s, kind of Annie Hall. But the one I would be most likely to wear is the plain white dress. I haven’t bought anything retail for several years. The last thing was some workout gear for Pilates–hard to find vintage leggings. Ha ha! Yes, workout gear was quite different before wasn’t it? Surprisingly enough lots of that vintage 80s workout gear is coming back in fashion and people want to buy it. Wow, I didn’t know this about your shopping past, Suzanne. It makes your conversion to thrifting and environmentalism even more admirable. People capable of positive change are special; the fate of the world rests in their hands. Yes sometimes I think it is difficult to believe that was me buying all that fast fashion. I have my fingers crossed that mankind will be able to make the changes required to save the planet. I am surprised! I thought you had shopped secondhand for much longer than you actually have. I’m so glad you do because what totally fabulous outfits you’ve posted for our delectation over the years I’ve been following your blog. We don’t have any consignment stores where I live and in fact they’re relatively rare in the UK. We also don’t have estate sales but we do have car boot sales and thrift stores so it’s not as if there aren’t any alternatives to retail here. I’ve heard a bunch about the fab car boot sales over there. I don’t go to estate sales as often as I once did. There aren’t as many the past couple of years. More people are choosing to have online estate sales and the prices are often much higher. I’m interested Ann, what was your moment of epiphany? What exactly brought it on? Do you remember? I keep telling my husband we need to get over to Belgium for a visit as your shops and the pieces you find are always incredible. 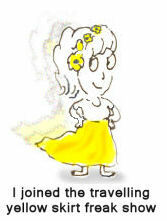 I loved reading your evolution story Suzanne. 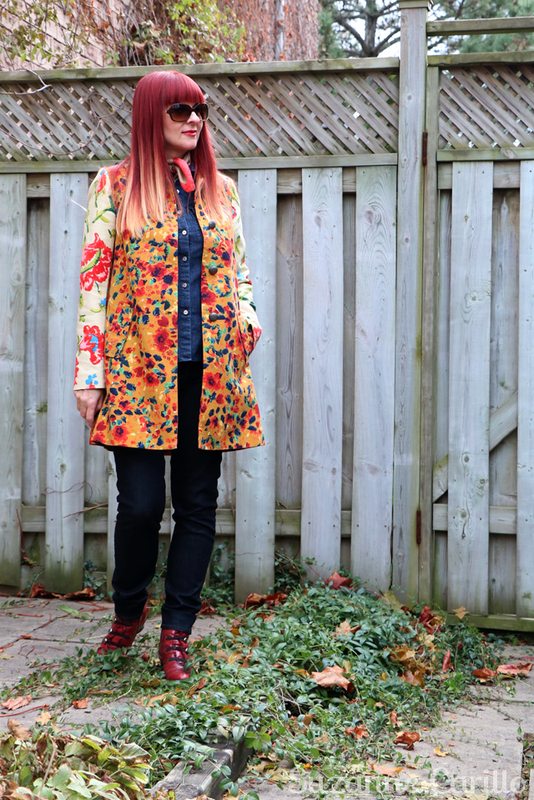 I hadn’t been shopping consignment and thrift for more than a couple of years when I started to follow your blog. As I found more bloggers to love I was completely delighted to find that thrift shopping was so prevalent! You and a few others were the role models who encouraged me to rethink my shopping behaviours in ernest. Isn’t it funny so many of us found thrifting later in life? It is even better that it brought us together as people. very interesting to read your story! 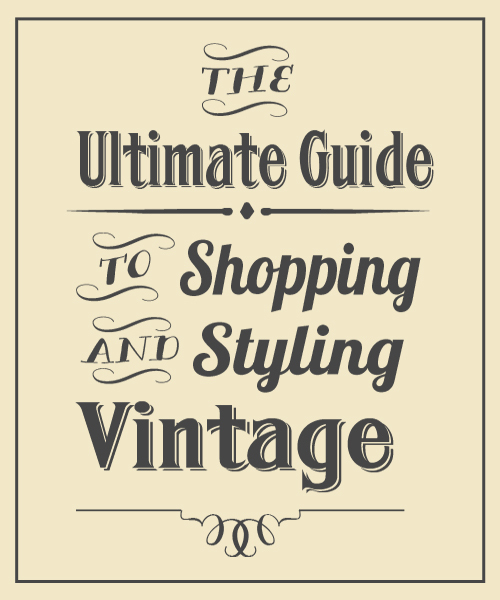 and i must say – with shopping 2.hand & vintage your style did grow into much more coolness! I think it is just awesome you have been shopping thrift you whole life. Bravo! I didn’t know you when you were doing the fast-fashion. Your transition is inspiring, and I hope many of us will take a gentle push from this. We can look fabulous and authentic in second-hand, and we can afford some truly well-made pieces. Then we can recycle them when they’ve served us (don’t forget to thank them : > ). I think you and Melanie have always been such great inspiration for shopping thrift. I am loving that bit about thanking my clothes for their service : ) Somehow it makes it easier to decide to sell or donate it. 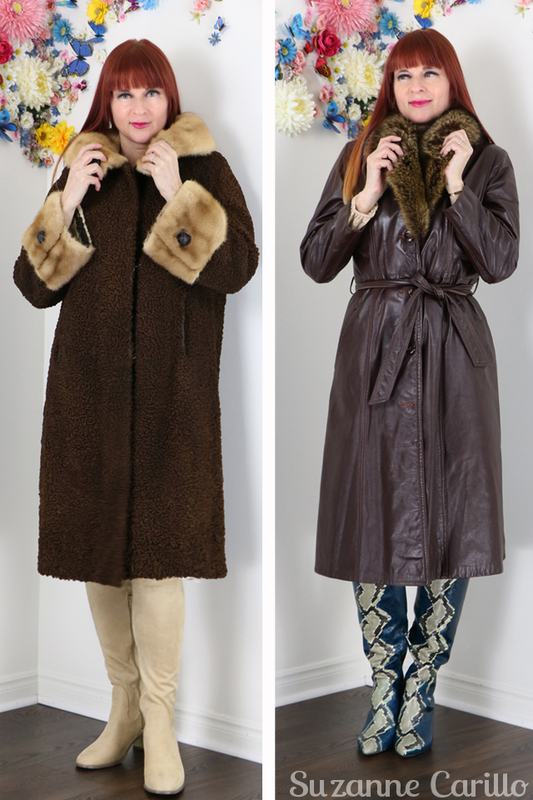 The amount of stellar vintage coats out there is incredible. The best thing? They actually keep you warm! Unlike 99% of all new coats made by fast fashion. I’m a long-time thrift / vintage / flea market / used clothing shopper. I made my first purchases near my mom’s in central upstate NY — a scratchy thermal “slip” dress (I think it WAS thermal underwear for women) comes to mind as one of the items — back when I was in high school. I’ve had brief forays with fast fashion, but I really don’t like all the polyester (I become walking static cling due to the carpeting at work) and I’m also too large. Unfortunately, my place of employment probably contributes to the Mountain of Clothing issue — we sell to big box places like Costco. Hopefully the saving grace is that the garments are essential basics — underwear and loungewear. I think it is awesome that you have been thrifting for so long Anne. I’m hopeful that more companies will start thinking about environmentally reducing their carbon footprint. Circular economies should be the norm. When I first started coming here I noticed lots of Anthro pieces but now your style is more diverse and unique than ever, since you starting thrifting. This is great. I’ve always been a thrifter, with some retail, but now, disappointed with the quality of new, I’m even more of a thrift shopper, with a focus on vintage style. This is a great story of your evolution. I hope that like Bella did for you, your message will resonate with carry it forward. I agree Mel. Thrifting has opened up my creativity. Like you I’m still a vintage lover at heart. I wanted to share the story so people understand how it was a journey for me and like you wrote, I hope to inspire someone else to rethink their current shopping habits. I hear you and I agree. Only there are not many good second hand shops in the Netherlands, but I will make more effort in finding some good ones. After all I did find two that provided me with quite a few good pieces. I would love to go to estate sales. But alas, again, there is no such thing here. I’m delighted that you are making some baby steps Greetje. The environment and your pocketbook are thanking you. Interesting reading about your shopping journey Suzanne. Living in a small city with limited good recycle shops and only tacky thrift stores I am always a little envious of those with access to a wide variety of options. I always keep my eye open when travelling.Fortunately we do not have the large chain stores here, not that they interest me the quality is poor , to say nothing of their ethics.If I buy retail and I do from time to time it is from a small local store and something I will wear forever. I love that faces skirt , if only my waist was smaller , working on that. 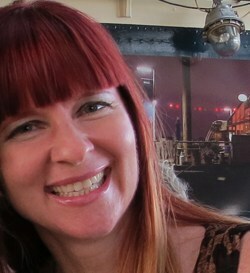 Many thanks for your thoughts on my blog, am in the process of changing to WordPress. Yes you are preaching to the converted here. LOL. I started shopping consignment stores about 10 years ago when I discovered them in Manhattan. I also thrifted as a teenager. As you say, the quality and workmanship of the designer brands are outstanding, and I certainly could not afford them if I had to buy them from a regular retail store. Further, the other selection In these stores was much better than any department store I have ever seen. Sadly some of them are closing. I have been in the habit of keeping my clothes for many decades, and I am very glad. I do love to shop your wonderful Etsy shop. Oh that mink trimmed coat and that blue tiered dress! So many treasures! I was never one for spending money a lot of money at chain stores, but I would spend a chunk of money on something from a independent designer at high end store, so I started weaning myself off of retail shopping several years ago because of how much money I was spending on one or two pieces. Close to 75% of my wardrobe was found secondhand, but I will still buy retail from small business owners that sell clothing from independent designers. Cancel that second “a lot of money” in that first sentence….jeez, I need to proofread my comments. I do buy alot of my clothes, over the past 4-5 yrs on Poshmark ( a thrifting online site ) for the US, and have found wonderful deals there. I have to be in love with something I buy and ask that question. 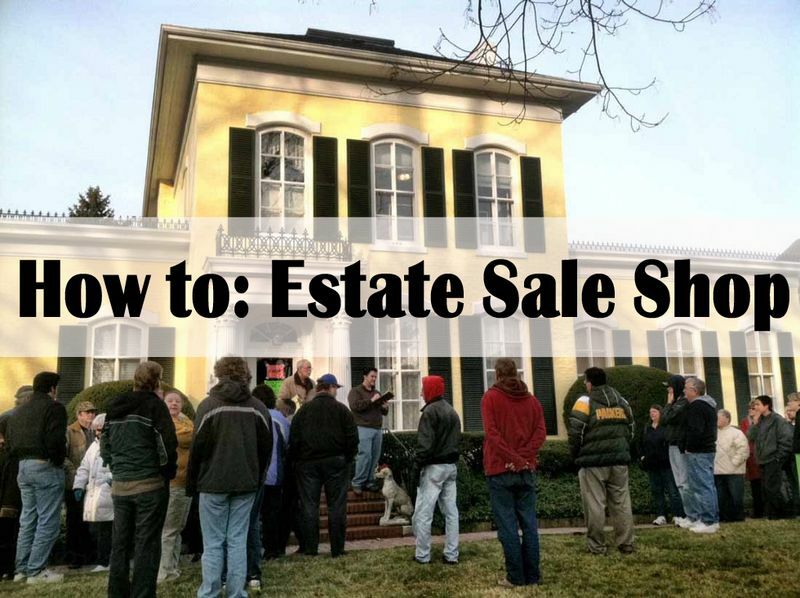 I enjoy consigment stores, and appreciate the info on estate sales, which I need to check out! I bought some great vintage pins at an Estate sale years ago, but forget about it. Thanks for the reminder! Great post!!! I loved reading about your evolution! I was never a big shopper, because I didn’t have much money as a teen, and didn’t like a lot of the trendy clothes from cheaper stores (I’ve always had a bit of a vintage aesthetic). I started learning about fast fashion when I was about 20 or so, and started turning to thrifting and vintage for my fashion fixes- so much better for the wallet and the environment! I also found what you had to say about Anthropologie very true. I used to lust over their clothing when I was a teen, but we don’t have one nearby, so I would only visit it about once a year or so when we went to Edmonton. I always loved their stuff, but seldom purchased. I hadn’t been in one for a few years, and then this past summer stopped in to see what was new and was seriously underwhelmed by the store. It seemed to lack the quality and creativity I remembered it used to have. So- I’m glad it’s not just me who feels that way. Now I don’t need to bother wasting time stopping in!